Saddam Hussein's trial quickly fell into chaos after its resumption Sunday, as one co-defendant was dragged out of the courtroom, then a defense lawyer was ejected, and finally the former Iraqi leader himself was removed after shouting, "Down with the traitors!" and demanding to leave. The new chief judge in the trial, Raouf Abdel-Rahman, had sought to show a tough control over the court, but the session, the first in a month, began to fall apart quickly. After the defense lawyer was removed, the entire defense team walked out as the judge shouted after them, "Any lawyer who walks out will not be allowed back into this courtroom." Abdel-Rahman appointed four defense lawyers, but two other defendants, Taha Yassin Ramadan and Awad Hamed al-Bandar, said they did not agree with the appointment and demanded to leave. They were escorted out, and the proceedings resumed, with the court hearing an anonymous female prosecution witness. The chaos began when Saddam's co-defendant Barzan Ibrahim stood and asked to address the court. Abdel-Rahman, who had already shouted at one defense lawyer for interrupting, told him to get to the point. Ibrahim called the court "the daughter of a whore." At this point, after about 15 minutes of transmission, the delayed television feed showing the proceedings was cut off. "Sit down and I will later give you the opportunity. Do not interrupt the court," Abdel-Rahman shouted at Salih al-Armouti. When the lawyer persisted, the judge said, "I'm speaking to you in clear Arabic language. Do not interrupt the court." The judge also changed the order in which Saddam and his seven co-defendants were called into the court at the start of the session. Instead of coming in last, the former Iraqi leader was summoned first, apparently to avoid the scene of earlier sessions, when Saddam's co-defendants stood in respect for him as he entered. The resumption had been delayed for nearly a week when some judges on the five-member panel hearing the trial opposed the appointment of Abdel-Rahman as the presiding judge. Saddam and his seven co-defendants are charged in the deaths of about 140 Shiite Muslims following an assassination attempt against the former Iraqi leader in the Shiite town of Dujail in 1982. The defendants could face death by hanging if convicted. Saddam and his half-brother and co-defendant, Ibrahim, have frequently interrupted the court with outbursts, speeches and complaints. 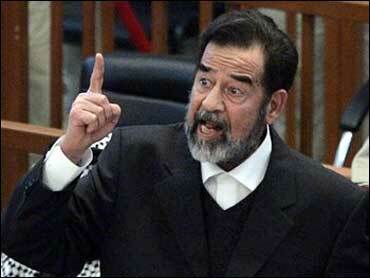 In one session, Saddam refused outright to attend. Barzan, a one-time chief of Saddam's intelligence, has been more belligerent, insulting witnesses, one of the judges and the three prosecutors. Heading into Sunday's session, Saddam's defense team said they would file motions questioning the court's independence and legitimacy because of the shake-up among the judges. "The trial is going through a legal crisis," lawyer Khamis al-Obeidi said. "The new chief judge needs a long time to familiarize himself with the details of the case." After the last session on Dec. 22, the court was thrown into confusion when the chief judge hearing the case since the beginning, Rizgar Mohammed Amin, resigned. Amin cited health reasons for his decision. Initially, court officials said Amin would be replaced by his deputy, Saeed al-Hammash, a Shiite. However, the government commission responsible for purging members of Saddam's Baath Party complained last week that al-Hammash should not serve as chief judge because of his one-time membership in the former ruling party. Abdel-Rahman, who, like Amin, is a Kurd, was brought in to serve as chief judge. But a new session last Tuesday was cancelled at the last minute because some of the judges were angered over the shakeup. Abdel-Rahman was born in Halabja, the town where Saddam's forces allegedly launched a poison gas attack in 1988 that killed 5,000 Kurds. Some relatives of Abdel-Rahman were among the dead, according to his family. Saddam is expected to eventually go on trial for the Halabja deaths. But the current trial, which began Oct. 19 and was holding its eighth session Tuesday, is for the killings of about 140 Shiites in a crackdown that followed a failed assassination attempt in 1982 against the former ruler in Dujail, 50 miles north of Baghdad.